ingredients: Ingredients: Sucrose, Glycerin, Water, Ground Coffee Sodium Cocoyl Isethionate, Sorbitol, Propylene glycol, Disodium Lauryl sulfosuccinate, Sorbitol, Sodium Laureth Sulfate, Sodium Stearate, Sodium Myristate, Stearic Acid, Sodium Chloride, Diazolidinyl Urea (and) Iodopropynyl Butylcarbamate, Triethanolamine, Tetrasodium EDTA, Benzophenone-4, Methylparaben, Propylparaben, Fragrance, colorant. A multi colored sugar scrub with oh so fun Cotton Candy fragrance! ​Pricing is per 4 oz. jar. Activated charcoal with a complex blend of grapefruit zest, succulent mango and sandalwood. Inspired by our recent trip to Indonesia, this lightly exfoliating cleansing sugar scrub is exotic and invigorating. It's the perfect blend of coffee and coconut with just a hint of cinnamon! As true as it gets...Smells just like spring in the garden of my childhood, when the Lilacs were in full bloom! bath bombs...making bath time fun! Like a day at the beach! The fragrance of spring, a true lilac...heavenly! A silly blend of banana and orange scents. A huge hit with your little monkeys!! We have have added a fun new collection of square bath bombs in limited quantities. We will be changing these up as the seasons change. Same great quality as our traditional bath bombs. Sold only in four packs as shown! Can't decide? This combo pack is perfect with one of each, Cherry Almond, Blueberry, Lilac and Sweet Honeysuckle. Oh the sweet smell of spring flowers! Awesome fruitiness here! Our ever popular Cherry Almond and a bright sweet Blueberry. Limited supply for spring. New for Valentine's Day & into Easter! Smaller than our traditional bath bombs (2.5 oz.) but so much fun to swirl in the bath! A beautiful water fragrance with a hind of ocean breeze. Like bath bombs but for the shower! Place in the shower away from the drain and take as hot of a shower as you can stand, The indirect spray will fill the steam with the amazing aroma of eucalyptus & menthol. They are a great relief for stuffy heads! . Sold in packages of three single use steamers. 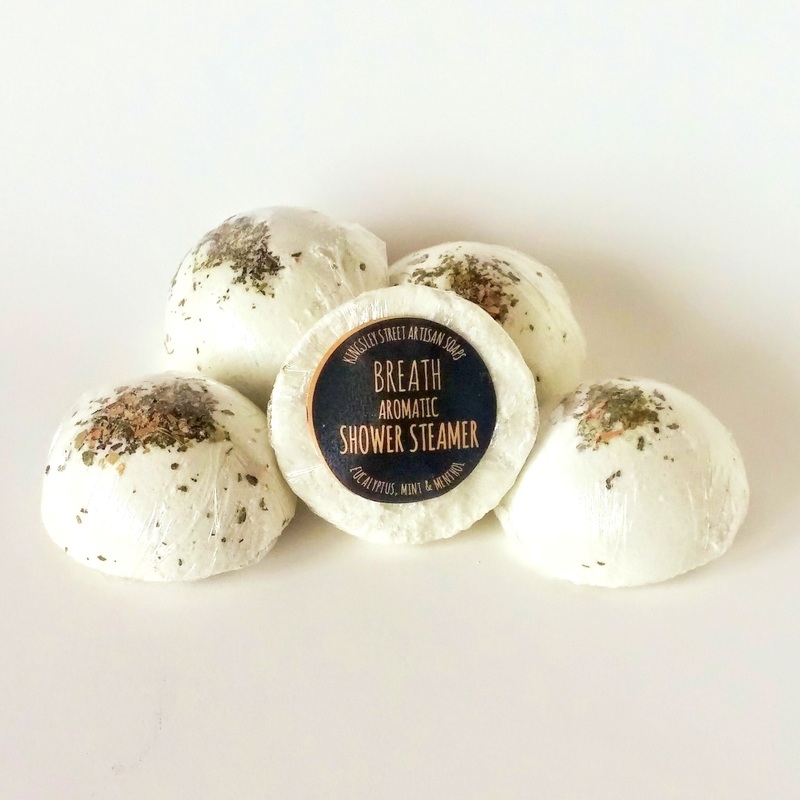 A soothing shower steamer made with lavender essential oil and Chamomile fragrance oil. Sold in pack of three. A bright wake me up steamer made with Orange, Lemongrass, Grapefruit Lime & Ginger Essential oils. sold in sets of three.